The Islamic State has set a new standard for Islamist terrorist groups. Now, blurry footage of executions or of a few men surrounding a flag will not do any more. The propaganda videos of the Islamic State are generally of a high quality, and include interviews, documentaries and reports, apart from the usual terror videos. The Islamic State employs various highly professionalised institutions dedicated to spreading its message and attracting foreign fighters from all over the world. The Al-Hayat Media Centre is probably the most prolific one – it has published multiple videos with Islamic State fighters and the captured journalist John Cantlie – alongside an English-language magazine, Darbiq, and a French-language online magazine, Dar al-Islam. As part of my minor thesis, I translated and analysed the first two issues of this latter magazine. The first issue, which was published in December 2014, is dedicated to the project of the Caliphate itself. In it, the anonymous writers introduce the reader to the Islamic State and seek to establish the legitimacy of the Caliphate through quotes from the Qur’an and hadiths that propagate the gathering of Muslims, the naming of a Caliph, the pledge of allegiance to him, and the killing of anyone who opposes this idea. Another article in this issue lists a number of pledges of allegiance by jihadist groups from Algeria, Libya, Egypt, Yemen, and Saudi Arabia to Abu Bakr al-Baghdadi, the leader of the Islamic State. In this first issue, the Muslim community as a whole is portrayed to experience a time of trials, evident in the oppression and persecution by the infidels. This also indicates the nearing of the end of times. The gathering of the “armies” from different parts of the Arabic world, then, is seen as the fulfilment of a prophecy, an event that will lead up to a final battle against the infidels, which can be equated to the concept of Armageddon in the Christian religious tradition. The key to victory is the Caliphate; only through its establishment can victory over the infidels and the governors installed by them be accomplished. The Islamic State will not stop there, though. According to the magazine, it is only a matter of time until the Islamic State will “liberate Rome”, which is the seat of the Catholic Church. 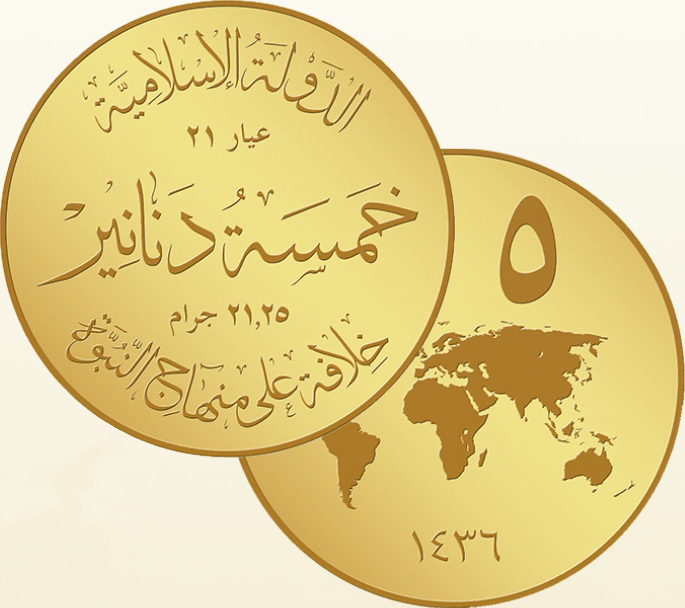 The last article of the first issue is dedicated to the proposed new currency, and in particular the coins, which were created in an attempt to increase the Islamic State’s legitimacy. Each of the seven coins, which are made of gold (dinar), silver (dirham), and copper (feloos), has its own symbol, stemming from quotes from religious texts. The goal, according to the authors, is to deliver the Muslim community from infidel-imposed money and the “satanic usurious world economy”. The second issue is more aggressive in its tone. It was published after the Paris Shootings of the 7th to 9th of January 2015, in which Amedy Coulibaly, a follower of the Islamic State, shot and murdered six people. As a result, the main goal of this second issue was to justify the killings, and to call on other Muslims to commit similar acts of violence. The calls for violence are backed up by a “history of France’s enmity towards the Islam” reinterpreted to fit the views of the Islamic State. The fact that Pope Urban II, the instigator of the first Crusade, was French, suffices as a proof for France’s enmity in general. After the French Revolution, Roman Catholicism was replaced by the “religion” of laicism and democracy, yet the persecution of Muslims prevailed in the form of the colonial wars. The authors further complain the anti-terrorist laws in modern-day France, and claim that France is conspiring with Zionists, aiming to conquer the Levant from the Muslims and give it to the Jews. In an attempt to whitewash the atrocities committed by the Islamic State, Coulibaly is being depicted as an “ideal Muslim”, as “an example to follow”. Numerous positive traits are ascribed to him, and unnamed sources are cited to back up the claims. While it is mentioned that he is a former convict, the reason for it – armed robbery and later his involvement in a plot to free an Islamist terrorist – is not, and it is claimed that he used his time in prison to convert a liberal Muslim into a fervent believer. The article is illustrated with a picture of Coulibaly, which is contrasted by a picture of Muslim men holding “Je suis Charlie” signs, who are called “apostates”. Another article from the same issue is an interview with Coulibaly’s wife, Hayat Boumeddiene. As it was the first sign of life after a sighting in the border town of Tell Abyad in northern Syria on the 10th of January 2015, this article managed to draw the attention of both French and international media. In it, Hayat calls upon Muslims to read the Qur’an, and on Muslim women in particular to support their husbands and other relatives by giving them comfort and advice. As ideal Muslim women, she names Assiya, the wife of the Pharaoh who lived during the time of the Israelites’ Exodus, as well as the Virgin Mary. This article is interesting in particular as it is both the only article with an author known by name, and as it constitutes the only article specifically aimed at women. The image of the enemy that is propagated in Dar al-Islam is rather broad. It includes Jews and Christians, the latter of which are usually called “Crusaders”, as well as Shia Muslims. Both Christians and Shia Muslims are seen as polytheistic idolaters; while Christians revere the Virgin Mary and Jesus, the Shia Muslims revere for the twelve Imams. The war against the West is justified as a righteous punishment for the persecution of Muslims. However, Christians are still allowed to live under the Caliphate, as long as they recognise Allah as the only God and as long as they pay the taxes. Jews, on the other hand, are seen as a “band of vipers” that needs to be exterminated. They are accused of slandering and killing prophets, as well as controlling the world, partly through the Masons, who according to the magazine control the banks and instigated the French Revolution. In terms of style and design, the magazine is rather lacking in quality. Spelling mistakes and bad syntax are common, and in the introduction of the second issue, the authors complain about criticism from Western journalists and academics for it. They also condemn the “pseudo-partisans of jihad” on the social networks – which is self-contradicting, as the Islamic State is very much guilty of the same crime. It is also notable that only a minor percentage of the text was actually written by the authors. Large parts of the text consist of quotes from the Qur’an, hadiths, and speeches given by spokesmen of groups affiliated with the Islamic State. Instead of presenting a convincing argumentation, the authors count on the reader’s belief – through the insertion of quotes from religious works, they make it hard for a believing reader to contradict the claims made in the text. Overall, it is noticeable that Dar al-Islam only enjoyed minor attention from the propagandists at the al-Hayat Media Centre. The English-language equivalent, Darbiq, has more content and is professional in terms of style and design. Meanwhile, the war in Syria and Iraq rages on, and it can only end if the steady flow of foreign fighters is halted, and the Islamic State and its propaganda are put to an end.